…and when I say parents, I really mean you – mom! At 11 years old my son has only had about 3-4 sleepovers and they’ve all been at our house. I’m starting to wonder if sleepovers are still a “thing” that kids do. Regardless, this past weekend my son convinced me that he should invite 2 of his good friends over for a sleepover. …he also invited the 5 year old sister of one of the boys to have a sleepover with my 5 year old daughter (they go to school together also). That’s right, my son convinced me that having 5 kids in my house this weekend was a good idea! Did I mention that I decided to go buy a car on the same day as the sleepover? With 2 kids? By myself? Um, yeah…. After visiting 3 car dealerships with 2 bored kids and signing the papers to my brand new Jeep Cherokee, I rushed home to a messy house to welcome 3 additional kids over for the night. I must have still been on my “new car” high because I welcomed these kids with a huge smile and was ready to watch these kids enjoy their night. 1. 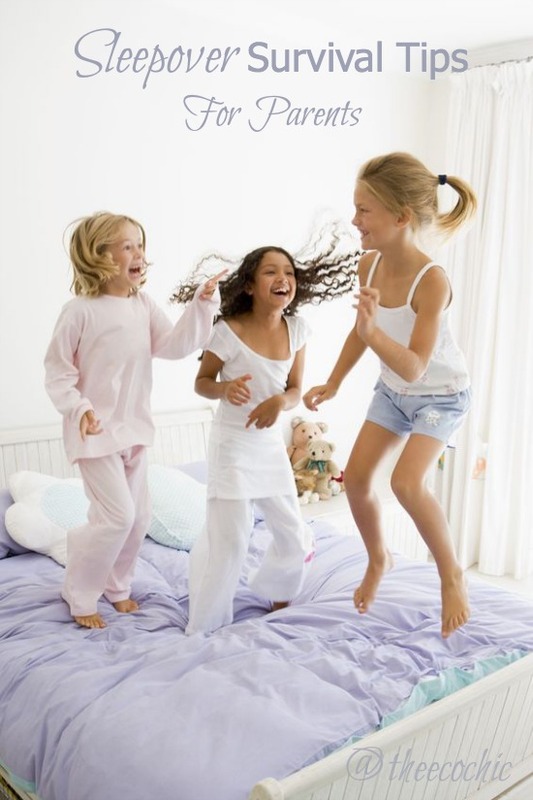 Find out each child’s comfort level with sleepovers! I knew going into the night that all 3 children may not make it past midnight and they may want to go home. Two of the kids have never slept away from home; while the other one has slept over before. As long as all the parents involved are committed to late night (or early morning) pick-ups, I’m cool with it! I personally don’t think there is a standard age for when your child is ready for that first sleepover, you’ll just know if it’s right for your child. 2. Talk with the guests and let them know they can come to you for anything! Perhaps I should have been very specific with this one because we had a few surprises throughout the evening and next morning. For instance, I didn’t realize that one boy had a cell phone to call home….until mom knocks on the door at 11:00PM to pick him up. That’s the same time I found out that he cracked his iPad he brought with him. Maybe I should have set up some guidelines for these things at the beginning of the night. a) If you’re going to call your mom, please let me know! b) If you break something, please let me know! It would make my interactions with the other mom a little easier. Oh, and he ended up staying at my house!! 3. Brew a pot of coffee at midnight, you’ll be up for a while! I started to nod off after I got both of the girls to fall asleep on the sofa (one on each side of me) and the boys were still going strong. I did tell them that it was quiet time but they could stay up as long as I didn’t hear them. I managed to get about an hours worth of rest before I heard them laughing in the other room. Quickly went to remind them that the Mr. had to work in the morning and may get a little crabby if they woke him. I only had to remind them 2 more times to keep it down; the last time was 2:30am. 4. Expect the unexpected! Around 4:30 am my daughter woke up and found her way to my room. I was a little worried that her friend might get scared to wake up in our house and to be all along in the dark. Around 5:00 am I heard her shuffling in the hallway and decided to go check on her. She was trying to find her brother but couldn’t figure out in the dark which one he was. I settled her down with him and went back to my room to try and get a few more hours of sleep. I didn’t expect what came next….see #5! Yes, by the time I saw this text the mom was already on her way over to my house to pick up her little girl. This was her 2nd trip over for the night (errr….morning) and she arrived within just a few minutes. 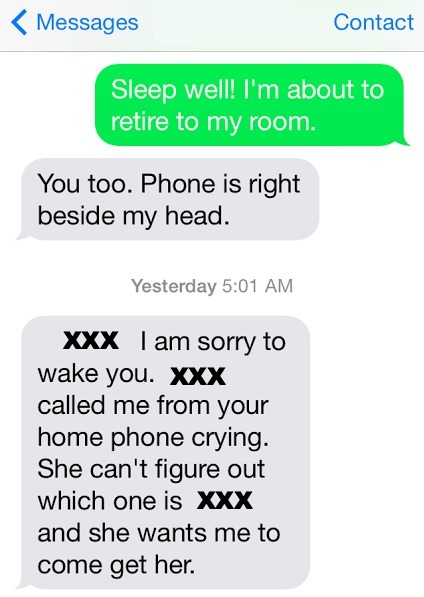 Apparently the little girl was smart enough to find my home phone AND call her mom at 5:00 am. I’m actually quite impressed because my daughter still doesn’t remember our phone number and I don’t think she’d even know where to start looking for a home phone. 6. Just go with it! I hope you’re laughing as much as I am because I didn’t let any of this bother me. It’s all part of letting your kids grow up and experience new things. You hope they’ve learned what you’ve taught them (like your phone number) and know how to cope when things don’t work out. The girls got into a few arguments and I had to let them work it out on their own. The boys all got along fine but they didn’t want the girls in their room playing with them; I had to let them all work it out. A little positive redirection with the girls (by pulling out the princess tent and sleeping bags) gave the girls their own party separate from the boys. There’s a lot of improvisation that happens at sleepovers and you just have to go with it! 7. Remember your memories of the night will be different from theirs! The next day both of my kids were laughing and talking about what a great night they had. They didn’t remember any of the little tiffs they had with their friends. They didn’t care that so-an-so’s mom came over. They didn’t care that their friend was missing the next morning. They just remember the good stuff, the laughs, and the fun they had with their friends. If you think back to your sleepovers when you were kids I’m sure you only remember the good stuff too. To the parents of the kids who slept over at my house this weekend, please know that I write all of this in humor and I truly enjoyed your kids staying with us. If I don’t write this stuff down, how on earth will I remember it when I’m old? Tell me your funny sleepover stories, I’d love to hear how your survived! Hilarious!! Kudos to you for keeping your humor on! !